BOISE, Idaho – Andrew Johnston took a giant step to accomplishing his goal of earning a PGA TOUR card Friday morning at Hillcrest Country Club. 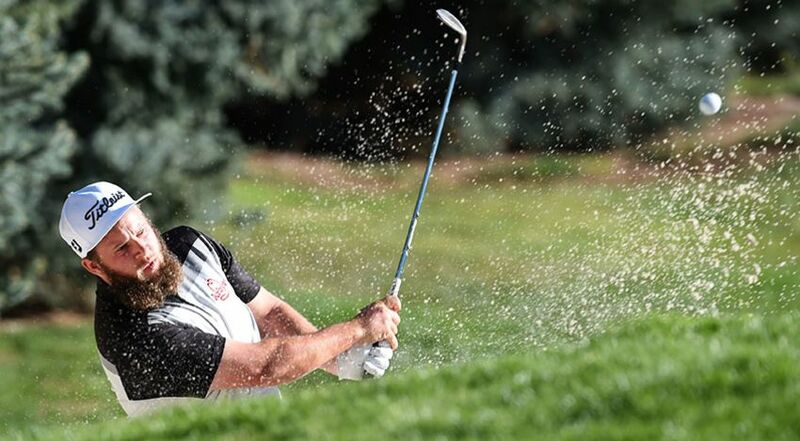 The 27-year-old from London, England known to fans as “Beef” posted an 8-under 63 to take the 36-hole lead at the Albertsons Boise Open presented by Kraft Nabisco, the second of four Web.com Tour Finals events. Johnston’s 13-under-par 129 total places him two strokes ahead of Scott Stallings (65) and Miguel Angel Carballo (64) heading into the weekend. Sam Ryder, Keith Mitchell and Mackenzie Hughes sit 10-under-par 132 after the second round. There are 13 players within five strokes of the lead. Johnston won earlier this year on the European Tour at the Real Club Valderrama Open de España. Sitting at No. 17 in the Race to Dubai rankings, Johnston decided to travel across the Atlantic and see if he could earn his TOUR card, once he found out he was eligible for the Finals. Johnston is looking forward to playing both major tours if he can successfully navigate the four-event series. Johnston acknowledged that he’s missing some of his favorite events at the moment to chase his dream. He skipped the Italian Open this week and the Porsche European Open to play in Boise and Columbus next week. With the golf season seemingly never ending, Johnston’s long-term plan is to play in the biggest events on both the PGA TOUR and the European Tour for many years. Johnston turned pro in 2009 and struggled his first couple of years. Last year he changed caddies and started working with a new swing coach. Those are significant changes to make halfway through a season, but the gamble has paid off. This season, Johnston won his first professional event and finished solo eighth in the 145th Open Championship at Royal Troon, in just his third major start. Stallings backed up his first-round 66 with a 65 on Friday. The three-time TOUR winner posted just one top 10 this season on TOUR. With his exemption up from his victory at the 2014 Farmers Insurance Open, Stallings was forced to compete in the Finals and has really seen his form improve these past few weeks. Bubba might not make the Ryder Cup team this year..
Intersting read. Apparently Bubba isn't very well liked on the Tour and that is apparently a back story as to who might - or might not - be given DL3's final Ryder Cup pick. Very interesting reads! Thanks for posting. Beef apparently did well enough to get his PGA card this weekend. Not seen many fast food places advertising on the PGA players shirts, but he has Arby's on his, - which makes perfect sense .. Ha!